MONTREAL, August 30, 2011 – Woozworld (www.woozworld.com), a massive multiplayer user-generated social game for tweens (ages nine - 14), announced today that it has raised $6 million in new funding. In addition, Bernard Gershon, former General Manager and Senior Vice President of Disney, has joined its board of advisors. Woozworld received $6 million in funding from Telesystem and iNovia Capital along side industry angels. 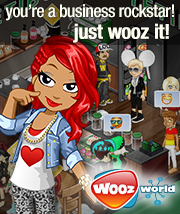 With this new round, Woozworld intends to continue developing and promoting its online user-generated social platform, where tween users build entire worlds to creatively engage with their peers, build businesses or set up restaurants, hotels and games as they choose, as well as focus on its upcoming mobile efforts. To help ensure its continued success, Bernard Gershon has joined the board of advisors. Considered to be the pioneer of streaming media, Gershon is currently the President of GershonMedia, a global digital media strategy practice. He was also the Senior Vice President and General Manager, Corporate Strategy, Business Development and Technology, at The Walt Disney Company. Gershon was instrumental in delivering Disney/ABC content, including “High School Musical”, “Desperate Housewives” and “Lost” to the Sprint mobile video service. Previously, Mr. Gershon was Vice President of ABC News Radio, responsible for all information programming produced for the ABC Radio Networks’ 140 million weekly listeners. Woozworld continues to dedicate itself to creating a safe gaming environment that tweens can enjoy and parents can trust. Targeted for children ages nine to 14, Woozworld provides an engaging and interactive experience by allowing members to create their own world where they can fashion their own characters, make new Woozworld friends, and conduct virtual businesses. All personal information is protected, and Woozworld strictly conforms to the Children’s Online Privacy Protection Act. Woozworld Inc. is a developer and operator of virtual worlds. A recent spin-off from Tribal Nova Inc, the company markets and operates Woozworld.com, an innovative global web 2.0 virtual world for tweens that is built and led by its users. Its unique environment evolves continuously and allows users to create space, run activities and do business among countless other things. The company has a highly experienced team with exceptional credentials in producing casual games, MMOG and virtual worlds for kids, as well as in marketing and business intelligence.